Q. How many pictures of the boys’ room re-do do I have to show you? But not tonight. I have them all ready and uploaded, but I am beat. seriously. I can barely keep my eyes open right now. Avery lost a tooth!! Actually, it was really loose and he let Wade pull it with pliers. I was safely in another room. Pulling teeth makes me squeamish. 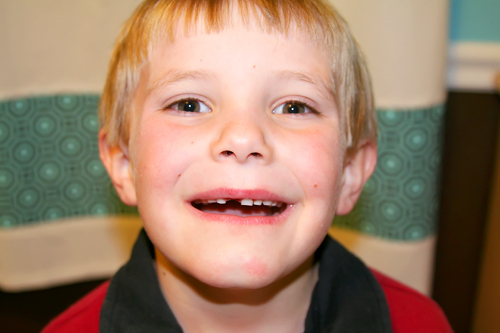 *shiver* To top it all off…his other front tooth is loose. Can you see where this is going….?? Uh, yeah. Avery may be singing “All I Want for Christmas…” in the next couple of weeks! Can you feel the cheesy scrapbook page coming?? I’m off to bed. I will be posting the room re-do tomorrow. I promise. Madison is going to be so jealous. She has been trying to pull her top 2 front teeth (which are not even close to loose) for the past month in hopes that she could get her new ones for Christmas.